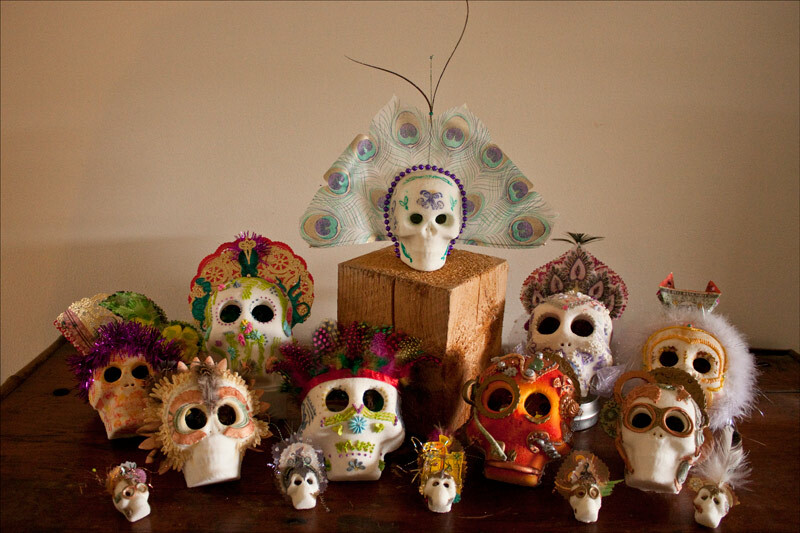 To see all Floating Collages and Skulls as separate images, visit the GALLERY page. As a writer, I think in narrative. As an artist, I make 3-D "floating collages" to depict stories, events and concepts. Converting 2D to 3D is like changing from passive to active voice, and adding adjectives and adverbs. Changing "The moon is obscured by clouds" to "Dark clouds obscure the moon." Or: "My work suggests the flow of time" to "Time flows through my work." I cut shapes using paper-punches. To float the shapes on nails, I sandwich them between bits of vinyl tubing, then hammer them into wood. These layers inject "the movement of narrative time." How and where they're stacked define the story, action and relationships. Visual equivalents of adjectives, phrases, and subtexts float in adjacent layers. I literally hammer together the past, present and future. My subjects come from observations about people, issues, and themes—the stuff of literary essays. I've been writing books and articles since 1994. My "floating collages" are a whole new way to put my thoughts on paper. Skulls are now available at our Etsy store.